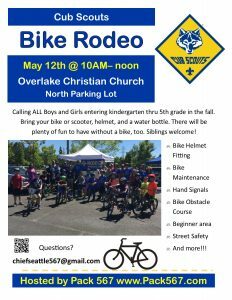 Join us May 12th @ 10AM- noon at the Overlake Christian Church North Parking Lot. Invite your friends, bring your bike/scooter, helmet, and a water bottle. We will have stations for hands on fun, plus some races for all ability levels. More Info here!